National Defense Minister Hulusi Akar and his Russian counterpart Sergey Shoigu discussed Syrian crisis in a phone call, a Defense Ministry source told Anadolu Agency (AA). Akar and Shoigu discussed regional security, the latest developments in Syria and bilateral cooperation during the phone call, according to sources, who spoke on condition of anonymity due to restrictions on talking to the media. 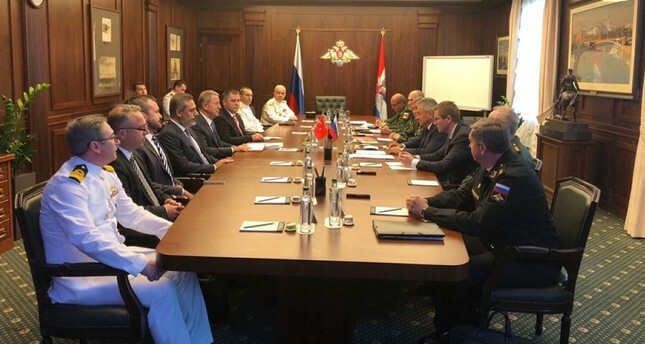 Turkish and Russian officials have been discussing options to avoid a military escalation in northwestern Syria's Idlib province. Turkey's Foreign Minister Mevlüt Çavuşoğlu warned last week that that a possible military solution in Idlib would be a "disaster." Syria has been locked in a vicious civil war since early 2011, when the Bashar Assad regime cracked down on pro-democracy protests – which erupted as part of the Arab Spring uprisings – with unexpected ferocity.